When we first drove the D90 we were quite impressed with the car as a whole but noticed that there was some definite turbo lag. The question arose - has Tata lost some of the car's bottom end grunt in the quest for more power? The only way to find out was to drive the D90 and the Quadrajet75 back to back up the same stretch of road with the same driver behind the wheel. The idea is simple. 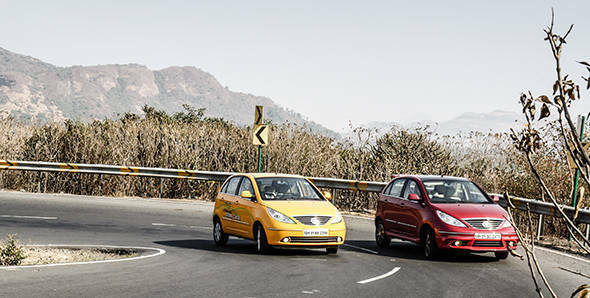 We chose a 2.5km long ribbon of steeply inclined ghat road. In the middle were six steep hairpin bends, plenty of sharp blind corners along with a couple of open stretches where we could find higher gears. The only rules were that we don't cross sixty and that we drive naturally  not revving beyond necessary or lugging the engine at unreasonably low revs. The car with the least number of required gearshifts wins. First off was the new D90. Now this car uses the same Fiat Multijet diesel engine that's under the bonnet of the Quadrajet75 but with a new variable geometry turbo. Variable geometry turbos have movable vanes that help the turbo spool up faster. In theory this should cut down lag and make for improved drivability. But like we said, the Vista still has quite a bit of lag till the revs hit about 2000rpm. Lag is most apparent on an incline when you floor the throttle but get no response from the engine. Right from the first uphill left hander it was evident that lag would be a factor over the entire route. By the first hairpin it was clear that the D90 needed to be shifted down to first to prevent it from stalling. This happened over four of the six hairpins. Once the turbo spooled up the engine revved up quickly which meant that we actually found fourth gear a couple of times. All in all the D90 completed the run with 23 gearshifts. The reason for this change in drivability is that the D90 gets a shorter 1st gear and final drive ratio. Unfortunately, these changes in the gearing don't benefit the car when revs drop. While the D90 may have lost some of it's low end grunt it definitely has a stronger midrange. This translates to a better highway driving experience with a stronger, more satisfying surge of power. In gear acceleration times are improved as well thanks to the stronger surge of power. The power delivery is smooth and there isn't too sharp a spike when the turbo comes on. Even in city driving conditions the D90 felt slightly more relaxed to drive thanks to the lighter clutch. Unfortunately the D90 seems to have lost out in terms of fuel efficiency returning just 15.1kmpl to the Quadrajet's commendable 19.4. Tata is also constantly working on the suspension set up of their cars and the D90 reflects it. Ride quality is perceivably more refined. Road noise and harshness is also filtered out more efficiently and it feels more resolved in the handling department. Even the interiors have been reworked and the centre mounted instrument cluster has moved in front of the driver while there's fully automatic climate control and a new touchscreen stereo system. The car holds a line fairly well but both cars suffer from vague and lifeless steering that tends to get quite fidgety with speed. Also a smaller, more ergonomic wheel would have been nice. Another issue is the gearbox which doesn't have a very nice feel to it  almost like the internals are made of plastic. Shift action isn't heavy but the gearbox doesn't feel precise and you have to slot the gears purposefully if you're shifting in a hurry. The Quadrajet75 then isn't much slower than the D90 but it is far more efficient. There's also the factor that the D90 costs a significant Rs 40,000 more which makes the Quadrajet75 the pick of these two. What Tata motors needs to do is transfer the improvements in suspension set-up and interiors to the Quadrajet75. That will make for a rather convincing offering.